Free download BullZip PDF Printer latest version. In order to create PDF files from all types of documents BullZip PDF Printer is a tool which sets up a virtual printer in windows. 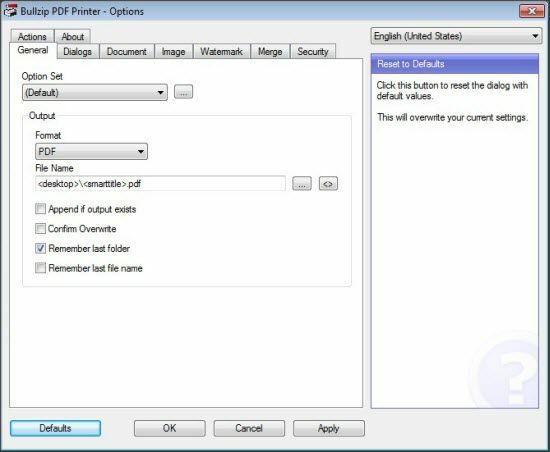 In this way this app allows any application to create PDF files using only in printer menu. During the period of installation, it offers to download and install G host script lite,a third party program which BullZip PDF Printer needs in order to properly function. The user interface is standard, Dialogs, Merges and security as well as Actions. In the general section, the users can create or copy a new option set, select the output format and specify its default name, confirm overwrite as well as remember last folder and last file name. In document the users have the ability to set the document properties of the generated file, PDF quality, initial zoom level, quality setting and compatibility level. The image section of this app allows the users to control the creation of an image file by configuring the device, horizontal and vertical resolution and others. By using BullZip PDF Printer the users can also stamp their document with a text watermark and also customize its font, size, color, layer, position, rotation and outline width. Furthermore, the users can merge and superimpose PDF documents and they can also set a password with customizable key length and allow increase the file security.